London studio David Kohn Architects and artist Fiona Banner have won the A Room For London competition to design a temporary one-bedroom apartment on top of London's Southbank Centre. The winning design resembles a boat beached on the roof of the Queen Elizabeth Hall. A Room for London was a design competition instigated by Living Architecture and arts organisation Artangel, as part of London 2012 Festival, to create a room for two people to spend the night on a visible site or building in London. Visitors will be able to stay in the room during 2012 and bookings can be made from 8 September this year. Images are courtesy of David Kohn Architects and Fiona Banner. See also: Skyroom by David Kohn Architects. The design competition for A Room for London, which attracted entries from around 500 architects and artists from across the world, was instigated by Living Architecture, and Artangel, in association with Southbank Centre. The brief was to create a room on one of the most visible sites in the British capital, where up to two people at a time could spend a unique night in an exemplary architectural landmark. 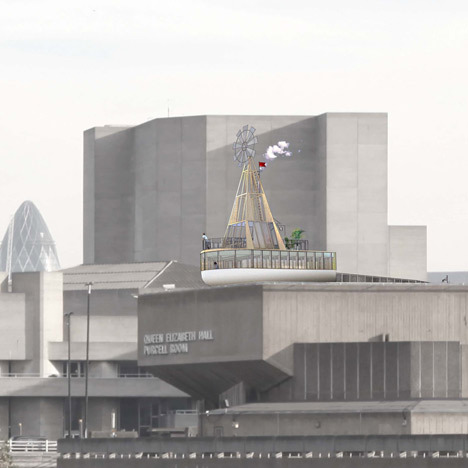 Kohn and Banner’s winning design is for a boat which, perched on the Queen Elizabeth Hall roof, will appear to have come to rest there, grounded, perhaps, from the retreating waters of the Thames below. From the lower and upper ‘decks’ of this beautifully crafted timber structure, there will be extraordinary views of a London panorama that stretches from Big Ben to St Paul's cathedral. On arrival 'aboard', a nautical flag will be raised to signal occupation, with the visitors invited to fill in a logbook on the 'bridge' of the boat, detailing what they have experienced during their stay, out of the window as much as within themselves. This is contemporary architecture at its most playful, beguiling and thought-provoking. Alongside public booking, the Room will play host to a guest programme of special visitors – artists, writers and cultural commentators of all kinds. These ‘thinkers-in-residence’ will be invited to stay and encouraged to muse on the city at a moment in time, through writing, image-making, online postings or live webcasts from the Room itself as their own idiosyncratic entries in the logbook. Some contributions will be instantly experienced by the public; others developed slowly during the course of the year. All visitors will be offered a chance to share experiences of a night in the Room. Bookings for A Room for London - for no more than one night - will be available through the website from 1 January – 31 December 2012 with advance bookings going live on the website from 8 September 2011. A Room for London is a cultural collaboration between Living Architecture and Artangel in association with Southbank Centre and the London 2012 Festival. The London 2012 Festival is the finale of the Cultural Olympiad. It will be a 12-week UK-wide cultural celebration from 21 June 2012 that brings leading artists from all over the world together to celebrate the London 2012 Olympic and Paralympic Games through dance, music, theatre, the visual arts, film and digital innovation.